Chock-full of homey yet sophisticated recipes, the Vineyard Kitchen presents appealing seasonal menus to celebrate the best of each harvest. An acclaimed chef, Maria is the culinary director of her husband’s Robert Sinskey Vineyards in Napa Valley. Her mantra is “Eat seasonally, drink good wine and live a long and prosperous life.” Written like a seasonal cooking diary, you will feel like you have a new best friend. HarperCollins Publishers: 2003. Break off the tough ends of the Asparagus by holding the spear at the base of the tip and the root end and bending downward. 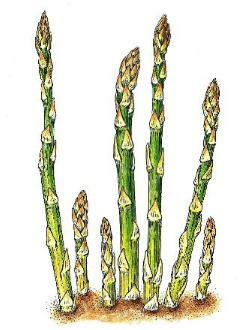 Allow the Asparagus to break naturally at the most tender point. Cut the tips off on the diagonal and slice in half. Slice the remaining stem on the diagonal 1/4” thick. Reserve with tips. Peel, trim and dice the Onion finely. Bring the chicken stock to a boil in a pot large enough to accommodate it. Reduce the heat and keep it at a simmer. Over medium heat, melt the butter in a heavy-bottomed stockpot until it bubbles and starts to turn golden. Add the Onions and sauté them until they are translucent and tender, about 5 minutes; season with salt and pepper. Add the rice and sauté until it is hot. Add the white wine and simmer, stirring constantly, until the rice has absorbed the wine. Start to add the simmering chicken stock to the rice one ladleful at a time. Wait until the rice absorbs the stock before adding more; keep adding the stock and stirring constantly for 14 minutes. Add the lemon juice and zest, then add the Asparagus and cook 4 to 6 minutes more, adding stock as necessary, until the rice is tender but not mushy or soupy. The rice should be creamy and silky with the individual grains holding their shape. Fold in the grated cheese and Chervil; season to taste with salt and pepper. Spoon the risotto into bowls and garnish with shaved Reggiano Parmesan. Serves 8 as a main course or 12 as an appetizer.